Pomme Natural Market has opened a new store in the West End! Less than a year after opening the first store, Pomme Natural Market’s second location is now open at 1722 Davie St., situated right in the heart of the beautiful West End. With a market already thriving in Port Coquitlam, Pomme is proud to be able to provide its highest quality, healthiest, most forward-thinking food and products to the West End community. 100% locally owned and operated, Pomme Natural Market was founded by a group of individuals with strong backgrounds in organic and natural grocery who are passionate about supporting the local food system.The store owners’ collective nine children provide the ownership group with valuable perspective and help them recognize the importance of ensuring that future generations can enjoy a healthy lifestyle that is grounded in a healthy diet. 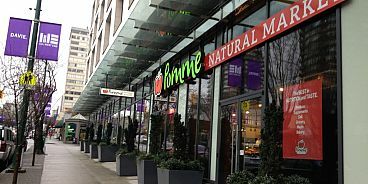 Pomme Natural Market caters to a wide selection of customers and intends to become a positive presence in the West End just as it has at its Port Coquitlam location. Those who have specific dietary needs or restrictions will find that the market carries a number of products that are especially ideal – whether it is a gluten or dairy intolerance, a restriction on sugar, or a vegan, vegetarian, or paleo diet, Pomme carries a wide variety of food options designed to specifically meet the needs of any customer. They have a 100% organic deli and produce section, locally sourced grass-fed dairy and meats, as well as a large selection of health supplements and eco-friendly lifestyle products. As a strong supporter of local business, Pomme Natural Market is excited to meet its new neighbours in the West End.